Search-form presets - search for 'economy' and 'compact' car at the rental location 'Crans-Montana - Crans Montana'. Address: Garage Continental, Crans-Montana, 3963, Ch, Switzerland. You can also change the search presets to other inexpensive car classes - 'Mini' or 'Compact'. If your budget is limited, it is better to book a car in advance, since rental rates increase with decayed availability of vehicles. Quite often, the cheapest options of golf-class cars in Switzerland can be found in airports. The most popular models representing the mini, compact, and economy car segments in Crans-Montana are: Peugeot 107, Toyota Aygo, Hyundai Atos, Mini Classic, Ford Fiesta, Hyundai Accent and others. When hiring a budget hatchback, it is definitely worth saving on insurance deposit (franchise). Deposits on small cars in Switzerland vary from 100 to 1.000 euro/dollars. Check the rental conditions of each car in your selection to find a vehicle with a minimum deposit. If your routes in Switzerland are foreseen to pass through hilly areas or mountains, it is not recommended to consider very small cars for rental. Their engines are usually insufficient for a confident driving on the roads with long or steep climbs. At the rental office in Crans-Montana, consider to take a 'Breakdown Assistance' package or ask an officer for a contact data to use in case of a vehicle breakdown. Cheap cars are sometimes unpredictable in operation. Upon receipt of the rental invoice, please check that all the information, as well as the final payment amount do match the data in your voucher. 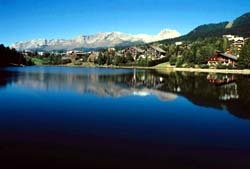 OrangeSmile.com wishes you a safe and great trip to Crans-Montana! Switzerland is home to the third largest tunnel in the world - Gotthard. It is made under the mountain range with the same name. The tunnel connects the northern canton of Uri with the southern canton of Ticino. The length of the tunnel is almost 17 km. Local drivers are distinguished by quiet and accurate driving style. Foreign drivers should also be very careful on the roads of Switzerland. Do not forget to stop at pedestrian crossings and always give way to drivers who want to make a maneuver. We cannot forget to mention that locals simply adore sports cars. Such vehicles can be found literally anywhere, even in small towns. Collectible cars can also be seen there, but you will never see old or dirty cars on the roads of Switzerland. Virtually all major restaurants and shops accept credit cards, so it isn’t necessary to take large sums of cash with you. In case of withdrawing money from credit card through an ATM a fee making out 1 to 5% of the amount may be charged. Stores open no later than 9:00 am and serve clients to 6:00 - 7:00 pm. In Saturday, working day is shorter, stores may close at 4:00 pm. Sunday is a day off common to all the shops and public institutions. Holiday-makers should remember that sporting equipment should be stored in accordance with hotels rules. Almost all hotels have a special room where you can leave skis and other sports equipment. Carrying skis and other sports equipment to the room is prohibited. It also impossible to enter in restaurants and cafes with sports equipment; all eating places are usually equipped with a special parking near an entrance. Before you leave a pair of skis at the entrance to a public institution, be sure to mark it. You can tie a bright ribbon or clip a card with the name of an owner. The fact is that many vacationers have very similar sports equipment and it can be easily confused with someone else's. In restaurants and cafes it's common to leave a tip, 10% of the order would be sufficient. In some institutions, a service charge may be included in the bill, but you can round off the amount and leave an extra fee for a waiter.